1.Extract Firmware zip file that you downloaded already from above link, you will get a .tar file and some other files. 2.Extract Odin zip file and you will get Odin3 v3.07.exe along with few other files. 3.Power off your phone. Wait 5-6 seconds for vibration to confirm complete switch off. 4.Now, put the Galaxy Ace Duos S6802 phone in Download Mode by pressing pressing and holding down the Volume Down, Home and Power button and you will be soon welcomed by a green robot indicating you are in Download Mode. 5.Now run Odin3 v3.07.exe (see Step 2) as an Administrator because Admin privileges is required to complete the process smoothly. 6.Now connect your Galaxy Ace Duos S6802 with your PC using USB cable. A message will arrive under Odin’s message box in the bottom left saying “Added!!”. If you don’t get the same then you should try another USB port (try USB port located in back in your desktop PC). If that too don’t work then you should then reinstall the driver. If you successfully see the “Added! !” message in Odin then you are ready to go in next step. You should also see COM port with a number in Yellow if you successfully added your device. 7.4.Click the PIT Button, and select the .pit file. Use only if you got it while extracting in step 1 above, otherwise ignore it. 8.In Odin window, make sure Auto Reboot and F. Reset Time checkboxes are selected. Also, make sure that Re-Partition checkbox is selected, only if you are using a .pit file (see Step 7.4). 9.Double check everything that we mentioned in Step 7 & Step 8 above. Now, once satisfied hit the START button to begin the flashing process. DID EVERYTHING, ODIN SAID, "PASS"!! 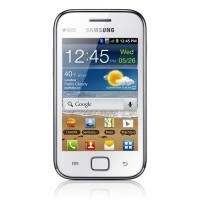 but on auto reboot only "samsung" s blinking for 30sec then again galaxy animation nd again "samsung" word! it s repeating!!! help me out!!!! As soon as it says pass in oden unplug the phone to prevent it from rebooting. Then reboot into recovery it will be there. why only 1 file I have when I extracted the ROM. Wht is new in this? No description given here about the software. I have already update my software to 2.3.6 android. why i also have 1 file in this rom, there is no csc, modem, bootloader ?